Bliss Carpet Now at Alcher Interiors! | Alcher Interiors, Inc.
Bliss Carpet Now at Alcher Interiors! We are pleased to be carrying Beaulieu Carpet’s latest Bliss line, which features Magic Fresh, Beaulieu of America’s self-renewing, odor-destroying treatment. 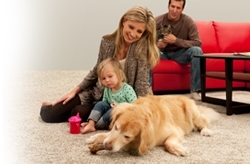 Developed in partnership with Stainmaster, Bliss’s new line is the perfect carpeting for tough-on-carpet pets and kids. Magic Fresh® odor reducing treatment works to reduce common odors in your home. Silver Release® antimicrobial carpet treatment inhibits the growth of odor- and stain-causing bacteria, as well as mold and mildew. Nexterra® backing is a superior and environmentally friendly backing made with a high percentage of post-consumer, recycled waste. Green Smart® eco-friendly fiber is made from 100% post-consumer water and soda bottles and recycled into beautiful P.E.T. polyester fiber. LuxuryBac® is our high-performance backing that provides for a smooth, wrinkle-free installation, guaranteed. SoftSense™ is a BCF polyester fiber formulated by Beaulieu and found in Bliss HealthyTouch that is both seriously soft and durable. PermaShield® advanced stain protection defends your carpet from life’s occasional accidents. Stop in today to view styles and learn more about the Healthy Home & SoftSense Bliss offerings we are proud to carry.